The 2016 Nissan Pathfinder remains a smart choice among 3-row family haulers thanks to its sedan-like ride quality and nifty features such as the Around View bird's-eye monitor and easy-access rear-seat entry system. But unlike the Honda Pilot, Toyota Highlander and Chevy Traverse, the Pathfinder seats only seven rather than up to eight like its rivals. The backup camera. I feel weird not having it when I drive my husbands vehicle. I love my Nissan Pathfinder. It is reliable, comfortable, roomy, etc. I love that it has a backup camera. The only thing I might say I do not care for is the USB connector does not connect my husbands android which makes him irritated. It does connect to my iPhone though. We have had some minor issues with that, the clock, and just getting used to the fact that the layout of all the buttons up front are hard to get used to. Other than those minor things we love the vehicle. My kids fit nicely. We have a third row in case we have extra people in the car with us. And there is just overall plenty of room for all of our stuff when we go on road trips. Nissan Pathfinder great family ride. 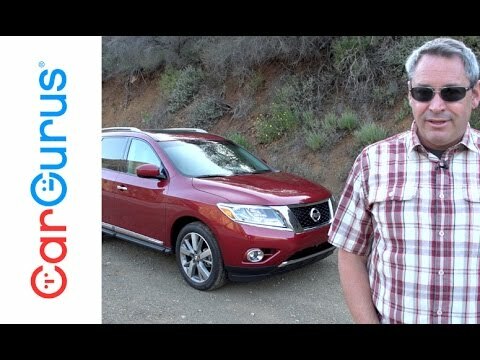 I drive the 2016 Nissan Pathfinder. It is my first SUV. I am not in love with it. I have always driven a truck. So going from our RAM 1500 to this Pathfinder is a big difference. I hate being so low to the ground and when next to passing traffic it moves the whole car. It does get great gas mileage and fits both my kids car seats while leaving plenty of room. The kids love the built in DVD players. It is great for long road trips but can get annoying when kids constantly want it on. The Pathfinder rides comfortably and has easy to navigate features and controls. I bought this car for the third row, I keep it folded down 90% of the time which allows me to fit a double stroller, groceries, and lots of other things easily in the trunk. The second row comfortably fits two large convertible car seats with the center seat armrest folded down. The only issue I have had is the automatic lift gate occasionally not opening or getting stuck.